The DT Talk team look at the third weekend of the NAB Challenge. Put your thoughts in the comments. If you haven’t done so yet, log into your team and make sure you have Mitch Clark (FWD, $156,000) locked and loaded. Most may already have the big unit on their bench but after tonight’s game they are shifting him onto their field. I was a little bit of a Mitch Clark doubter after his ‘rusty’ efforts last week but I am happy to say that I was mega mega wrong. I usually am. He kicked 3 goals in the first quarter and finished the half on 65pts. He was taking hangers and doing it all. He clocked up touches up forward, down half back and even in the ruck during the 4th term. He finished the game with 6 goals and an amazing 109 points. Wowzers! Why do we keep writing off Jimmy Bartel (FWD, $562,000)? He is currently only owned by 5.7% of coaches and was very good again tonight, especially early with 36pts in the first quarter. Although he appeared to take the foot off late in the game. It didn’t stop him from floating through half back picking up easy +6’s and rotating in the guts. He finished the game on a game high 111 (26d, 8t in 85% TOG) and is such a great pick as a forward, especially as no one else is doing it. Let’s not forget he scored 110 in the first NAB game. Josh Caddy (MID, $392,000) was solid early with 51pts at the half to finally finish on 99pts but no one is picking him anyway. Billy Smedts (DEF, $177,000) finally stepped up to the plate and was quite solid all night. He had 51 at half time to finish the night on 53 (75% game time). He certainly showed enough for his price but boy did he slow down. I’m always critical of Brad Crouch (MID, $524,000) and his ‘handball happy’ attitude. Tonight was better. He only found the ball 23 times (11 kicks) for his 89pts and boosted his numbers with 8 tackles and 6 marks. That’s what we like to see. He’s priced at only an average of 93 and should improve that over a ton this year. I thought that Nathan Van Berlo (MID, $272,000) showed enough tonight (84% game time). He whipped up 63pts and is only getting better and better with more runs under his belt. He was just consistent all night. Tom Lynch (FWD, $327,000) racked up 76pts but mainly in errors (56% efficiency). He was good in patches but terrible in the gaps in between. He’s had a free run on our grounds all pre-season, so is Brodie Smith (DEF, $465,000) getting a free run? He had quarter splits tonight of 10, 16, 16 and 13 for his total of 55pts (79% TOG) and looked very quiet all night. When you compare that to Andrew Mackie (DEF, $475,000) and his 98pts (23d, 8m in 79% TOG) are we spending our coin wisely? Sam Jacobs (RUC, $550,000) is rated as the number 1 ruckman this year in Fantasy. He scored 42pts after just sitting on 14pts at half time. He padding his stats with some cheap +6’s in the third term. He only played 42% game time so I guess we better forgive him to a certain extent. As for the youngsters… Jake Kelly (DEF, $120,000 – rookie listed) was solid but you’d think he scored 100+ the way the commentators were talking him up. He scratched up a loud 34pts and was easily over shadowed by Cam Ellis-Yolmen (MID, $120,000). He was the equal highest ball winner for the Crows with 23d and scored 70pts (69% TOG). He had 6 kicks and 17 handballs in that and if the kid can learn to use his boot… he might just be a top midfield bench option for us. After getting over the disappointment that #MYBoy Josh Kelly wasn’t playing, I settled in to watch The Baby Faced Giants up against Guessendon. Seriously who are some of these kids? Now it is clear that these were not their best sides. GWS rested some big guns and the Bombers INJECTED some youth/rookies/kids loitering outside into their team. Outside all of that there was some Fantasy relevance about this game. Mummy only played for a couple of quarters, but controlled the game in the air. Lots of handballs and just looked like a Great Dane amongst a pack of ferrets. His body holding up has always been the issue, but looks pretty fit this year. Took a while to warm in to the game, but dominated the second half. Significant amount of time up the ground. Cant see him having so much time in the middle when Griff, Ward, Kelly etc come back, but will continue to rebound well off halfback. 21 kicks and 3 handballs is a nice ratio. With the Giants early draw and lack of real defence premos, I reckon Heater is a nice pick. Forward rookie options are not too bad, but this guy is a little left field. “Sunshine” certainly presents well. 3 nice goals and 6 marks. Wouldn’t look out of place as a Carny in side show alley, but with Patton’s injury and Boyd’s departure, might just have a spot. I reckon he plays early. Handy F8. Showed a bit. Great attack on the ball, disposal sometimes let him down when pressured. Awkwardly priced for Fantasy but would consider as a bench option in Dream Team. Surprised when I looked at his numbers, seemed to be everywhere, especially in Q2 and 3. No#1 Draft pick coming into his 3rd year with a full pre season spells good things, but price is awkward. Keep an eye on him late for Draft based games. Leon Cameron tweeted some good things post game about McCarthy and Whitfield..
For the Bombers it is really hard to talk too much good stuff because it was like watching the grade 2’s try hard against the grade 6 team. However a couple to comment on. Scored 84 points.. but don’t, just don’t. He is not the mid priced back you want to pick. I thought he was the Bombers best player. 13 disposals, 6 marks and 6 tackles. Not sure where he sits in their best 22, but showed some good signs. There really wasn’t much else for the Bombers. If Shaun Edwards (DEF $164,000) is the defensive rookie saviour you were looking for, keep looking. 17 points says it all really. Overall I think this game was a bit of feast or famine. If you have GWS players in your team, enjoy chowing down on some tasty fantasy relevance. Whereas the Bombers players are like an empty plate full of uncertainty and no taste. Kind of like Tofu. Yes the Bombers are Tofu. Before the match started, two blokes who I was keen on watching were withdrawn from the Bulldogs’ squad – Mitch Wallis and Tom Boyd. I wanted to see what Wallis offered up some value in the absence of Libba, but even if he did play, I probably wouldn’t have got too much out of the game. The Dogs went in with a pretty ordinary team while the Dees were at close to full strength. Melbourne dominated the first half going into the main break 45 points up. The Dogs fought back in the second half with a big last quarter to go down by 7 points. But onto the fantasy stuff as it’s not about the game. On paper and as the first half demonstrated, the game was a massive mis-match so what can we get out of it? The leading fantasy scorer on the ground was Christian Salem (FWD $193,000), racking up 24 disposals, 9 marks and 6 tackles on his way to 118 points. He came onto our radar a fortnight ago when we heard about his new half-back role and he played that very well today… but remember he had just 32 points in pretty much a full game last week. He certainly offers a lot of value and will make some coin, but are there better forward options out there at that price or lower? Maybe. Lock him in as one of the players to gain DPP prior to round six though! Midfielders Daniel Cross (MID $476,000) and Dom Tyson (MID $510,000) scored 105 apiece. Tyson was the leading disposal winner on the ground backing up from an impressive effort last weekend. He also took 10 marks to help boost his total. Nathan Jones (MID $572,000) knocked up 103 points along with Jimmy Toumpas (MID $293,000). Five Demons took 10 marks in the match with 11 players taking 8 or more for the match. Ten @melbournefc players with 8+ marks so far. That seems like a lot. New game plan/style from Roosy? Although he managed 26 disposals (10 marks, 16 handballs), Heritier Lumumba (DEF/MID $402,000) only got to 69 fantasy points. His role was impressive, spending a fair bit time in the midfield, running back and attending a few centre bounces, but with only two marks to his name and one tackle, his numbers didn’t scream “pick me”. I must mention Ben Newton (MID $192,000) who did nothing to ‘unlock’ himself from our teams. He was busy early and finished with 19 disposals and 59 points from 70% TOG. I didn’t sight popular big man Jesse Hogan (FWD $194,000) a lot on the blurry stream, but he kicked on goal to help him to a modest 34 points (62% TOG). The rookie listed Aaron vandenBerg (MID $120,000) copped a cut to his head early and was limited to 1 handball and a tackle (6 pts) from his 15% TOG. So the Doggies didn’t look anywhere near how they’d line up in round one, however we probably can’t expect too much from them based on today’s game. Matthew Boyd (MID $540,000) was the midfield general in the depleted line up, collecting 21 disposals for his 78 points. We all wanted to get Mitch Honeychurch (FWD $179,000) at some point last year, but he might be a starting option based on his 75 (84% TOG). His scoring potential is much better than some of the key forward that are floating around in fantasy teams around that price. I’m not sure if Brett Goodes (DEF $192,000) will be among the points – or even best 22 – each week, but he showed why he was a popular rookie a couple of years ago scoring 69 from 68% TOG. The Bont, Marcus Bontempelli (FWD/MID $392,000) is looking like a beast and revelled in his midfield time with 7 clearences. He is a bargain up forward, but I don’t know if at his price I can fit him in. We finally got to see the little pocket rocket Caleb Daniel (FWD $157,000) in action. He found the ball 16 times, going by hand 12 times, to get himself to 48 points in 75% time on ground as the 168cm draftee ran around in his helmet. We can’t take a heap out of this but know that what we see next week in NAB4 will be more telling as teams will go into the game with a squad that resembles more of a best 22. The first thing that you need to do with this game is completely disregard anything for the Power. They were without Boak, Ebert, Gray, Lobbe, Carlisle, Wines, Westhoff, Impey, Jonas, Hartlett and Trengove. Basically they sent an SANFL side over to play. So due to that, the Tigers, who sent a fairly full side, were always going to win and win well. Now that is out of the way, who impressed. Well there was one guy that really impressed and if he wasn’t in your side already, then you need to get him in there right now and that is Dusty Martin (Fwd/Mid $553,000). He dominated this game, 28 touches, 6 Marks and 4 tackles equated to 109 DT points. He was simply awesome. With only Cotchin to come back into that midfield he should continue to score like that. Brett Deledio (Fwd/Mid $548,000) was a little quieter with only 19 touches and 79 points, but he will be better for the run, however, I would have hoped for more than this from him. Brandon Ellis (Mid $544,000) had 94 points, but given he is only a midfielder I just don’t think that he is worth the risk. He was ok, but remember, it was a very understrength Power team. Popular Rookie Kane Lambert (Mid/Fwd $120,000) had just the 12 touches for 39 points. He did kick a goal, but I was hoping to see a bit more from him. Next game we will hopefully see a bit more. I still think he will get the upgrade spot, but keep an eye on NAB3 for a better indication. Really other than that Taylor Hunt was good and Sam Lloyd kicked 4 goals but the rest of the team went through the motions and did what they needed to. For those thinking of Maric he didn’t really have any opposition and ended up with 27 hit outs and 6 touches around the ground for his 62 points. Nothing to get me too excited. For the Power, well Jared Polec (Mid $416,000) was their best with 105 points, but this won’t happen every week with all the other guys to come back in. Also he has a very awkward mid price. Karl Amon (Mid $120,000) did what he had to to keep putting his name up for selection with 18 touches and 3 tackles along with 7 marks. He had 77 DT points which would be awesome if he could replicate that with a full side around him. I still see him being fringe with a vest if he actually gets on the ground. Nathan Krakouer (Mid/Fwd $142,000) had another good game with 10 touches and 35 points, but really I don’t think this will be enough for him to get a full game in round 1 still. Other than these guys there really isn’t anything else of any DT interest to report for Port. For those wondering Johann Wagner (Mid $120,000) the winner of The Recruit played his first real game and was ok, but 4 touches, 4 tackles and 2 Marks for 33 DT points just solidifies thoughts that he will spend the year for the Magpies in the SANFL. So this game wasn’t a spectacle to watch and for the first half the Power really resembled Witches Hats as the Tigers did as they pleased. My warning is, don’t read a massive amount into this game. With both sides sending out relatively strong teams I really wasn’t expecting it to be as scrappy of a contest as it was at times. Sporadic periods of heavy rainfall did not help the skill level at all but we still had quite a bit to talk about from this game. That being said it was a horror game to be a forward. Between scrappy skills and poor delivery from the mids of both sides and the periods of torrential downpour I wouldn’t read much into any of the forwards low scores. One forward who may have to worry however is Michael Walters ($352,000 fwd) after collecting Bird high. Seems to have been reported for that one so pay attention to that news if he’s currently in your side and/or draft plans. The story of this match has to be Lachie Neale. Spent the game following Parker around the ground and found the ball 32 times himself. Finishing the game with 131 points from 73% game time. Neale did everything needed to lock himself into your sides this year with a fair amount of confidence. Worked hard to throw himself into and influence every contest he could get to. At $466,000 his awkward price may be the reason behind his low 6.4% of ownership but I’d expect that to rise dramatically after this weekend. We know that sometimes scores can look over inflated but believe me when I say from actually watching the game, Neale was quite literally everywhere. As far as the bloke Neale was following around goes, Luke Parker ($585,000 Mid) went about his game business as usual. 104 points from 84% game time is around what you’d expect from this superstar. Included 8 tackles and his usual trick of sneaking forward for a few goals too. Tom Mitchell ($432,000 Mid/Fwd) was his usual ball magnet self as well, racking up 66 points from 72% game time. Unfortunately from what we’ve heard, part of the reason for his lack of game time last year was the belief that he doesn’t work hard enough defensively. Hopefully his 4 tackles today goes towards proving he deserves more game time! Stephen Hill ($477,000 mid) showed us that it could be another year of struggling with a tag ahead. He was very well held by (possibly Bird?) to only 21 points from 85% game time. Two other players to watch would be Rampe and Rohan. Both look to be taking the job of running the ball out of Sydney’s defence. Either could certainly be worth consideration if you’re looking for value in your back line. Rohan ($270,000 Def) scored 50 points from 75% game time and Rampe ($380,000 Def) scored 47 from 83%. As far as potential rookies go, Isaac Heeney ($246,000 mid) got a fair amount of the ball for a first year player. Seems to have already built up a cult following and should be feature of fantasy sides in the future. Anyone who is a reader of Jeppa’s work would know his reservations about Heeney being managed and rested throughout the season. While this is highly likely, his body size does look more than ready to handle AFL life and his addition of this 56 point game from 75% games time doesn’t do anything to suggest he can’t handle it. Clancee Pearce (Def/Mid $280,000) finished the game with 20 points from 75% game time. I think people are already aware of my thoughts on selecting Pearce, if you still want to after todays game though, you’re on your own. If I have learned one lesson from watching the NAB Challenge Cup this year, it would be to avoid indulging in the typical pre-season hype, like a moth to a light at night, and stick to your guns! And when I say guns, I mean your AFL Fantasy gun players. The players that make up the core of your team, the reliable members that keep your team afloat throughout the hard times. Don’t get me wrong, its hard not to be a moth, though this year its important then ever to find the players that you can stick with through the thick and the thin; especially with these ridiculously high player prices! Tonight’s game was home to many players that caught my attention as well as players that made me want to slap my own face in disappointment (a facepalm if you will). So to make it easier to ingest the games scores I have decided to present my notes differently! Indulge…. At the top of this list would have to be Corey Gault ($252,000 FWD) who scored 71 points in only 83 minutes! Indeed a flash in the pan and definitely a non-fantasy relevant player, but it just goes to show you how deceiving the NAB Cup can be. Gault was the highest scorer for the Pies in what was a disappointing night Fantasy wise however, Dane Swan (do I really need to post his price and position?) did score quite well considering he was sporting a quite colorful vest to start the game?! 55 points from 58 minutes is a handy ratio, but you don’t win the grand fantasy prize based off dodgy pre-season ratios. Swan did however score better then fellow fantasy great Scott Pendelbury ($614,000 MID) keeping in mind that the latter did play 17% more game time! 58 in 78% game time is nothing to brag over however, refer to my first paragraph if you’re having second thoughts. Levi Greenwood ($576,000 MID) caught my eye with 61 points in 72% game time though I can’t see him fitting into my team. Unique yes, but you surely wouldn’t pick him over Beams, Crouch, Pendles or even Griffen? Harshly categorized maybe but considering his 74% game time, young Jordan De Goey ($202,000 MID) didn’t set the world on fire with 42 points. If I was to pay that kind of $$$ I would be expecting at least low 60’s, but in a game where most Pies players under performed I can give him the benefit of the doubt. A player that does deserve this headline would have to be Patty Karnezis ($197,000 FWD). 33 points in 69% game time says to me that he still has time to go before I can consider him at F5/6. Keep an eye out though, if my luck would be anything to go by he will probably pump out 150 next week! Buyer Beware! The following players will crumble and fall in front of your eyes if you which to ‘moth’ into selecting them. Andrew Carrazzo ($461,000 MID) 85 points in 69% game time. Fantastic but don’t get sucked in. Is Zac Dawson still playing?? On a serious note Kade Simpson ($521,000 DEF) and Patrick Cripps ($163,000 MID) scored very well in a young and experimental Carlton outfit. Simpson scored 76 points in 78% game time and must be in the front of your mind when selecting a D1. Evacuate the 20’s and 13’s from last year and you have a very good fantasy defender on your hands. The latter, Patrick Cripps, was a bright light in the game. 75 points in 77% game time for a player that is worth below 200k is surely worth investing. M7/8 looks like a pretty safe bet. Don’t drop your guard though, nobody is 110% lock and loaded yet. Apart from the above it was nice to see Chris Judd ($454,000 MID) doing what Chris Judd does best, 70 points from 72% game time is impressive from a man who was sipping on coconuts while swinging in a hammock not long ago. Nobody really to mention here but I think I will take this opportunity to wrap things up before I lose you and hand you on to the pleasant fantasy dreams that you will have and hopefully not headaches! The game was an interesting to cast my eye over the game, typical errors were evident from both teams and efficiency was at an all time low throughout the early stages. However, it was intriguing to see Carlton fend off a late surge from Collingwood to seal the win, a confidence boosting result i’m sure. Hopefully Swanny doesn’t make a habit of this Green Vest thing and things will go back to normal i’m also pretty of. In saying this, a week is a long time in Fantasy and as long as you don’t get drawn into the big numbers that some players magically dish up then you should be fine. 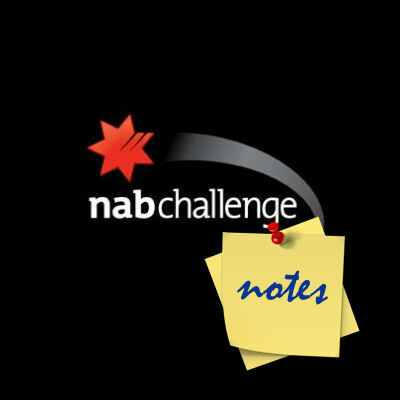 Discuss the third weekend of NAB Challenge games in the comments. OR anything around that price range that’s doable! ?